This year marks Seattle’s 30th annual concert of Ellington’s Sacred Music, the longest running in the country. Held in St. Mark’s Episcopal Cathedral, the concert will feature the 17-piece Seattle Repertory Jazz Orchestra (SRJO), co-directed by Michael Brockman and Clarence Acox, tap dancer Alex Dugdale, and the best of local vocal ensembles: the Northwest Chamber Chorus under the direction of Mark Kloepper, including vocal soloists Nichol Veneé Eskridge and Dr. Stephen Newby, as well as members of the New Revelations Choir, from Seattle’s First African Methodist Episcopal Church. Performed less often than his earlier works, Ellington’s sacred music presents a challenge of scale and time for musicians and audiences: each concert is truly an event. Lara Morrison, with support from the Interfaith Council of Seattle, began in 1989 to produce the first sacred music concerts at her own financial risk at the University Christian Church, with Earshot Jazz providing assistance. Backed by a band that included Michael Brockman and Clarence Acox, soloists including pianist Marc Seales and saxophonist Don Lanphere, and the Total Experience Gospel Choir, Morrison brought a community together behind the enormity of Ellington’s music. In 1993, Morrison entrusted the stewardship of the sacred concerts to Earshot Jazz, providing some of the impetus for the formation of SRJO under Acox and Brockman in 1994. That same year, Earshot succeeded in raising enough money to purchase scores previously rented by Morrison from the Ellington Estate (which happened to contain notes and adjustments made by Brockman, one of the foremost Ellington scholars in the country). Throughout the years, this grassroots event has been a meeting point of the community and legendary Seattle musicians such as Floyd Standifer, Don Lanphere, Hadley Caliman, and Ed Lee. “Its expansive spirit welcomes everyone in,” says Earshot executive director John Gilbreath, who volunteered as an usher at the concerts when he first came to the organization in 1990. Built upon material from his earlier jazz suites that depicted his family upbringing and childhood in the Black church, the sacred concerts reflect Ellington’s late-career meditations on the struggle for freedom, justice, and forgiveness during the Civil Rights era. Their dissonances and harmonies joined sacred and secular values, drawing thousands of listeners during their first performances. 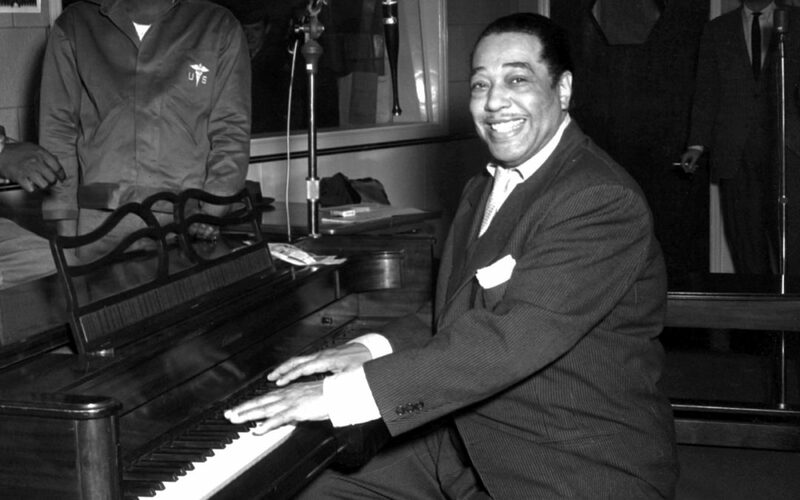 Thanks to the talents of Seattle’s performers and the grace of its listeners, Ellington’s message rings out clearly to us today, having brought, and once again bringing, the greater community together for a truly joyful noise. –Ian Gwin Tickets and more information available at earshot.org. Preferred seating is located in the front and center section of the church. Tickets and more information available at earshot.org. Preferred seating is located in the front and center section of the church.